Not finding the room you want? Let us help you! If you’re not finding available dates for the room you want, please click here to chat with an agent. Deep within the idyllic waters of the Exumas, Sandals Emerald Bay brings unprecedented luxury to the easy-going rhythms of the Bahamian Out Islands. This luxury Bahamas resort is a privileged enclave, designed to ensure you’ll feel like you’re the only ones there, where service reigns supreme and Bahamian-style architecture of elegant villas and suites harmonize with nature. Secluded within 500 tropical acres along a pristine, mile-long beach, civilized pleasure coexists with exotic adventures, from three impressive pools — including a half-acre, zero-entry pool with a dramatic fire pit in the middle — to 11 exceptional restaurants. Sandals Emerald Bay sits directly on a pristine, mile-long beach, deep within the idyllic waters of the Exumas. A quintessential island paradise with crystal-clear turquoise waters and vibrant coral reefs to explore. The swimming pigs of Exuma have evolved from a little-known secret to one of the world's most sought-after experiences. From deep-sea dives to bone-fishing expeditions, Exuma has a wide range of Bahamas tours and excursions to choose from. Discover the most innovative and luxurious rooms and suites. The stylish and spacious suites at Sandals Emerald Bay offer extensive views of the beach and the magnificent turquoise-green sea from its privileged location just feet from one of the Bahamas most beautiful beaches. Whether you crave an evening of sophisticated gastronomy, the barefoot elegance of oceanside dining, a refined afternoon tea, or a lively night at an authentic English pub, 11 unique venues offer a cuisine and ambience to suit every mood. Our exclusive partnership with Robert Mondavi Twin Oaks® wines raises the standard of the included wines poured at our all-inclusive luxury resorts. We also provide an amazing selection of wines for sale on our Manager's list. Unlimited premium spirits are included 24/7 and served throughout the resort. We have designed our bars exactly where they should be – right on the beach, directly over the ocean and even inside our beachfront pools. Grown in Jamaica’s misty Blue Mountain range, Jamaica Blue Mountain’s coffee possesses an unmatched superior flavor and it’s included throughout all our specialty restaurants, French-style cafés, Lounges, self-serve coffee stations, and indulging room service. No one throws a party like Sandals. Our Greg Norman-designed, 18-hole, par 72 championship course is consistently regarded as one of the best in the Caribbean by Travel + Leisure Golf. 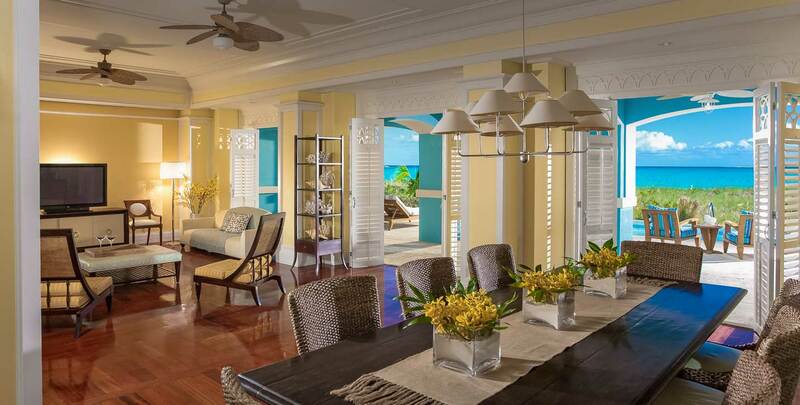 Unlimited play at Sandals Emerald Bay is included for butler-level guests only. All other guests can play 2 rounds free as part of current "2 Rounds Free" offer which is subject to change at any time. Sail away and indulge in a vast array of all-inclusive water sports. With our top-of-the-line equipment, professional staff and unparalleled tropical locations, you can choose to fly across the water - propelled by wind, motor or muscle-power - or dive beneath its pristine surface. 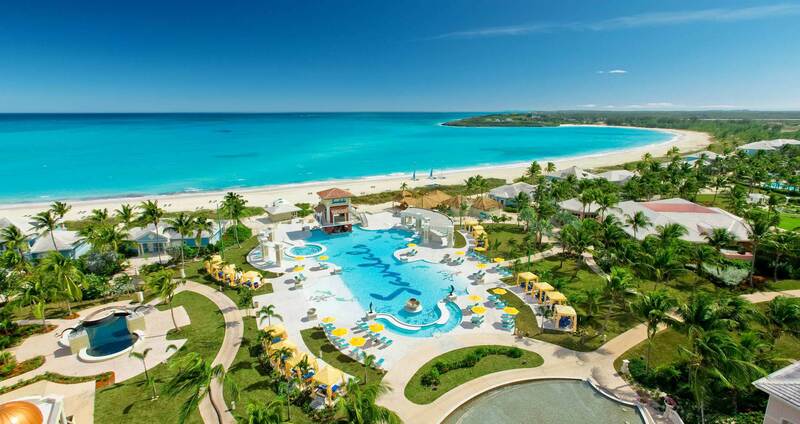 Sandals Emerald Bay features three fresh water pools including the Caribbean’s largest, zero-entry pool with a soaring sunset tower ovelooking the cobalt blue of the sea and a serpentine swim-up bar. Or, choose the Quiet Pool for total noise-free relaxation. Enjoy tennis day and night on lighted courts, croquet on manicured lawns, and volleyball on pillow-soft sand. Plus, our fitness centers feature state-of-the-art equipment and certified instructors. Our unprecedented Butler Service, only available in our very highest level of suites, provides our most discerning guests with an unimaginably supreme standard of service and luxury, where your every need is anticipated. Trained in accordance by the Guild of Professional English Butlers. The Luxury Included® experience begins at Club Sandals where concierge guests can enjoy exceptional service and complete relaxation in the comfort of a stylish lounge. At Sandals, all gratuities are included. From bellhops, to waiters, to bartenders, all tips are taken care of. In fact, only personal butlers are allowed to receive tips. Enjoy Sandals Resorts’ industry–leading hospitality and personalized service, and leave your wallet at home. A Sandals all-inclusive destination wedding takes the worry out of planning, giving you more time to enjoy the moment. Best of all, even your wedding is FREE when you stay 3 nights or more! At Sandals Resorts, making the right connection is always at your fingertips. Staying connected with loved ones is easier than ever at Sandals Resorts. Enjoy FREE INTERNET ACCESS throughout your vacation from any device, anywhere on the resort including all rooms. From the moment you arrive we start taking care of you. Relax and enjoy your stress-free ride with non-stop airport resort transfers featuring air-conditioning and comfortable, spacious seating. Or, opt to arrive in style in a private luxury vehicle, which is available for an additional cost. Caribbean-inspired spa treatments are available at the 16,000-sq.-ft. exclusive Red Lane® Spa. A tranquil sanctuary for relaxation and rejuvenation, offering 17 treatment rooms, steam room, and several intimate relaxation areas in secluded garden. Oversized rooms, plush suites and island style villas of Sandals Emerald Bay offer all the elegance of a private island home and are designed to be luxurious sanctuaries with every conceivable amenity and incomparable views. The culinary experience at Sandals Emerald Bay is unrivaled in the Caribbean, celebrating epicurean treasures from the renowned hills of Tuscany to the delectable bounty of the sea. Whether you crave an evening of sophisticated gastronomy, the barefoot elegance of oceanside dining, a refined afternoon tea, or a lively night at an authentic English pub, 11 unique venues offer the cuisine and ambience to suit every mood and whim. Overlooking the cobalt blue of the sea, Sandals Emerald Bay features three fresh water pools including the Caribbean’s largest, zero-entry pool with a soaring sunset tower and a serpentine swim-up bar. Or, choose the Quiet Pool for total noise-free relaxation. Designed by golf legend Greg Norman, the award-winning championship golf course at Sandals Emerald Bay is recognized as one of the most scenic ocean-side golf courses in the Caribbean. Flight schedules vary by season and are subject to change. Get up to $1,000 Instant Credit. The $1,000, $755, $555 & $375 Instant Credits are in USD, applied to the base fare and excludes government taxes and fees, which must be paid at time of booking and is fully non-refundable. Promotion is combinable with certain Sandals savings promotions. Group bookings may be subject to space availability and blackout dates. Offer may be changed or withdrawn at any time. Receive 1 FREE night when you book 7-nights and pay a min. of 6-nights at this resort in select room categories. Book for 7+ paid nights and get Unlimited Green Fees in all room categories by Jun. 14, 2019. Book for 3+ paid nights and get 2 Rounds of Green Fees in all room categories until further notice. For travel now - Dec. 26, 2020. Blackout dates: Jan. 8 - 16, 2019 | Dec. 27 - 31, 2019. Book for 4+ paid nights and get Unlimited Green Fees in Butler categories until further notice. Offer valid for travel between now - Dec. 26, 2019. Unlimited rounds & 2 rounds of Green Fees offers are available per person, per room and is non-transferable between people in each room. Tee time is mandatory and based on availability. Tee time must be booked at the Golf Shop between the hours of 8am - 5pm daily. Practice range is complimentary with this promotion only upon booking tee times. Cart and clubs are available at an additional fee. These offers are applicable to 18-hole, 9-hole and twilights rounds of Green Fees. Offers are combinable with other consumer saving promotions at Sandals Emerald Bay EXCEPT with any additional Green Fees promotion. The multiple rounds of golf promotion is not applicable to contracted groups. Green Fees offers must be used during same stay. Offer is subject to change or withdrawn at any time. Offer applies only to consumer bookings made on Sandals.com. It is combinable with all current consumer saving promotions. Offer is not combinable with regular on going off rack rate percentage discount. Book any Sandals Resort (excluding INN) vacation of 6 nights or more to be eligible to receive a Sandals Branded Wine Basket & a $250 Spa Credit & a Free Candlelight Dinner for Two by April 23, 2019. IMPORTANT NOTE: This promotion WILL NOT have a registration page; you must enter the respective promo codes EGGSTRALUV when completing the booking in order to receive this promotion¿s offers. Blackout Dates: Dec. 27 - 31, 2019 | Dec. 27 - 31, 2020. Offer valid for all room categories at any qualifying Sandals Resort (excluding INN). Sandals Resorts bookings are eligible to receive a Sandals Branded Wine Basket & a $250 Spa Credit & a Candlelight Dinner for Two per booking. Guests MUST ENTER promo code Sandals - EGGSTRALUV when making the booking for guest to be eligible for the promotion¿s offers. The Candlelight Dinner for two must be reserved upon arrival and is only redeemable at the Sales Desk on the resort and must be taken during the qualifying stay as limited seating is available.